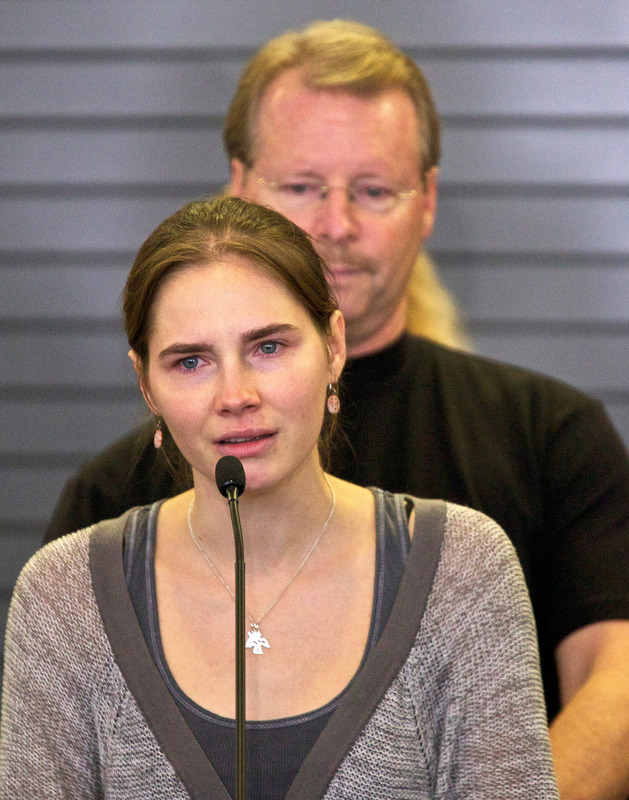 The Amanda Knox case is one of the strangest legal battles you're likely to ever come across. As a 20-year-old student studying in Italy in 2007, American student Knox and her Italian boyfriend, Raffaele Sollecito, were arrested and charged with the murder of Knox's roommate, Meredith Kercher. They were found guilty, but won their appeal and were set free after almost four years in prison in 2011. Then, the prosecution appealed, and Knox and Sollecito we retried for the same murder and found guilty again, before having that conviction overturned after another appeal, leading to their eventual exoneration in 2015. That might seem confusing, so here's an explainer as to why Amanda Knox and Raffaele Sollecito were convicted twice for the same crime. Within the United States legal system, being convicted twice for the same crime sounds a lot like double jeopardy. Double jeopardy is the common term applied to someone being tried for the same crime again after being found innocent the first time, and it's a protected right of U.S. citizens included in the Fifth Amendment of the U.S. Constitution that it should not be allowed to happen: "Nor shall any person be subject for the same offense to be twice put in jeopardy of life or limb." However, Italy does not have the same laws about double convictions. In addition to not observing a double jeopardy clause, the Italian appeals process works very differently than the one in the U.S. While in the U.S., the Supreme Court has the ultimate final say in lengthy appeals cases, that's not the case in Italy. Their Supreme Court of Cassation doesn't actually conduct trials. Instead, they can overturn verdicts from lower courts and force them to be retried. That's what happened in Knox's case. According to Italian law, Knox wasn't tried for the same crime twice; the entire process was all part of the same trial. The Court of Cassation overturned the first conviction due to flaws in the investigation. The prosecution appealed, presenting new evidence, and the Court of Cassation overturned the acquittal. A retrial was ordered, where Knox and Sollecito were again found guilty. This time, the defense appealed, and the Court of Cassation annulled this conviction, citing a lack of evidence and declaring the parties' innocence. This fourth decision was final, since the court annulled the conviction completely, rather than overturning it. It's a process that wouldn't happen in the U.S., but it made all the difference for Knox and Sollecito.